Donatello was commissioned to create his Cantoria for the Duomo in Florence around 1433. The piece was part of a program that intended to beautify the interior of the Duomo. Donatello's work began shortly after the sculptor Luca della Robbia finished a piece of similar size and subject matter that decorated the area around the cathedral's organ. Donatello's Cantoria had the functional purpose of providing standing room for the choir and was nicknamed the "singing gallery." 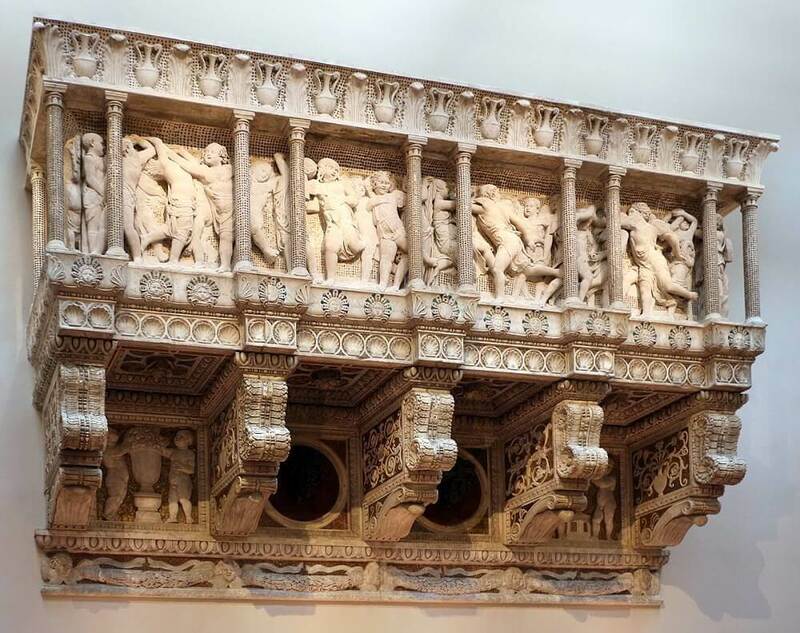 This enormous marble piece is composed of five large medievally styled columns. Behind the columns Donatello carved angelic dancing children in simple garments. These subjects are referred to as "putti" and were a common decorative element in both Donatello and Robbia's pieces for the Duomo. Donatello stayed faithful to his style that incorporated a variety of ancient iconography. Unlike Robbia he did not choose a specific passage from the Bible to highlight. The slightly unfinished nature of his subjects in the piece is often criticized and it is not usually described as one of his best works. In reality the unusual purpose of this piece coupled with its subject matter make Donatello's Cantoria unique despite any technical shortcomings. Scholars have argued the unrefined subjects may be due to the intended placement of the piece high above eye level or the tight deadline Donatello was required to maintain. It remains one of his most popular pieces to this day.